Super Hero Boy: The perfect last minute gift! If your anything like me you end up without fail, no matter how much planning you do, ending up having to buy a few last minute gifts and usually its because you just have no idea what to buy. Paramount Home Entertainment has planned in advance for us and has three dvd releases designed just for those last minute gift emergencies. 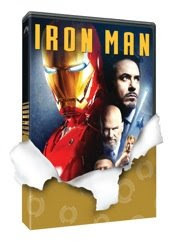 Paramount is releasing three of their most popular dvd's of the year wrapped in pretty gift wrap and with the simple addition of a bow or a gift tag they are ready to give to anyone on your list. I was really excited to see them as I have been fumbling for weeks over what to get a few of my friend's kids my budget has been extra tight this year and unlike previous years I just cannot seem to afford to buy each one of my friends kid's individual gifts so this year I've found that DVDs are a perfect solution as they appeal to the whole family and can be given as family gifts instead of just individual gifts. 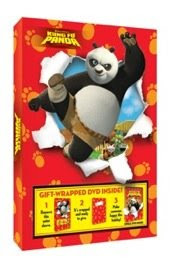 The three releases that are already waiting and ready in the stores are Kung Fu Panda wrapped in a pretty red with little paw prints, Indiana Jones and The Kingdom of The Crystal Skull wrapped in green with little Indiana Jones hats on the wrapping paper, and finally Ironman wrapped in gold with Ironman's symbol on the paper. All three movies were fabulous and we did previous reviews of all three. 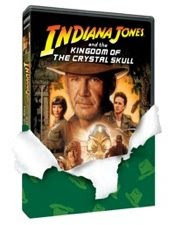 Indiana Jones won out just slightly as my favorite only because I've been a huge Indie fan since I was a child and it was good to see him on the big screen again not to mention it was great to have a newer version that I could share with my son. Don't go rushing around the malls like a madman just stop by any store that sells movies and pick up one of the wrapped and ready dvds and you will be good to go. You can pick up all three titles as well on Amazon. I'm providing individual links : Indiana Jones, Kung Fu Panda, Ironman. These are great gifts. Thanks for the ideas.